The Maria, by Miz Mooz. I comfortably wear a medium width shoe, and these were a little tight across the top where the decorative band is when I first put them on. But after walking around in them for a bit, they loosened up just fine, and now they are one of my go-to shoes! I have worn them many times already in the few weeks I've had them. 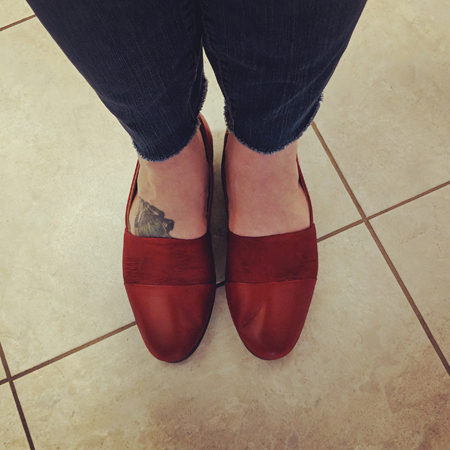 I love a good red shoe to have as a pop of color when I'm wearing neutral colors, or (as I was when I took the above photo) just a solid black top with jeans.